Whether you have autochthonous roots in Turtle Island or Africa, these are sermons we know all too well as colonial subjects. 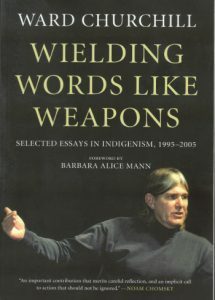 This selection of writings discusses such topics as the myth of anthropophagy in Indigenous societies, normalizing Native American dehumanization with terms such as “squaw”, Hollywood’s cinematic degradation of native people in film, the historical and ongoing genocide of North America’s native peoples, and the systematic distortion of the political and legal history of U.S.-Indian relations. Less typical of Churchill’s oeuvre are the essays commemorating Cherokee anthropologist Robert K. Thomas and Yankton Sioux legal scholar and theologian Vine Deloria Jr. More unusual still is his profoundly personal effort to come to grips with the life and death of his late wife Leah Renae Kelly (Kizhiibaabinesik), thereby illuminating in very human terms the grim and lasting effects of Canada’s residential schools upon the country’s indigenous peoples. A foreword by Seneca historian Barbara Alice Mann describes the sustained efforts by police and intelligence agencies as well as university administrators and other academic adversaries to discredit or otherwise “neutralize” both the man and his work. Also included are both the initial “stream-of-consciousness” version of Churchill’s famous—or notorious­—”little Eichmanns” opinion piece analyzing the causes of the attacks on 9/11, as well as the counterpart essay in which his argument was fully developed.